Human CD40 Ligand, His Tag (CDL-H5248) is expressed from human 293 cells (HEK293). It contains AA Glu 108 - Leu 261 (Accession # P29965-1). The protein has a calculated MW of 19.0 kDa. The protein migrates as 23 kDa and 24 kDa under reducing (R) condition (SDS-PAGE) due to glycosylation. Human CD40 Ligand, His Tag on SDS-PAGE under reducing (R) condition. The gel was stained overnight with Coomassie Blue. The purity of the protein is greater than 95%. Immobilized Human CD40 Ligand, His Tag (Cat. No. CDL-H5248) at 5 μg/mL (100 μL/well) can bind Human CD40, Fc Tag (Cat. No. CD0-H5253) with a linear range of 0.156-5 μg/mL (QC tested). 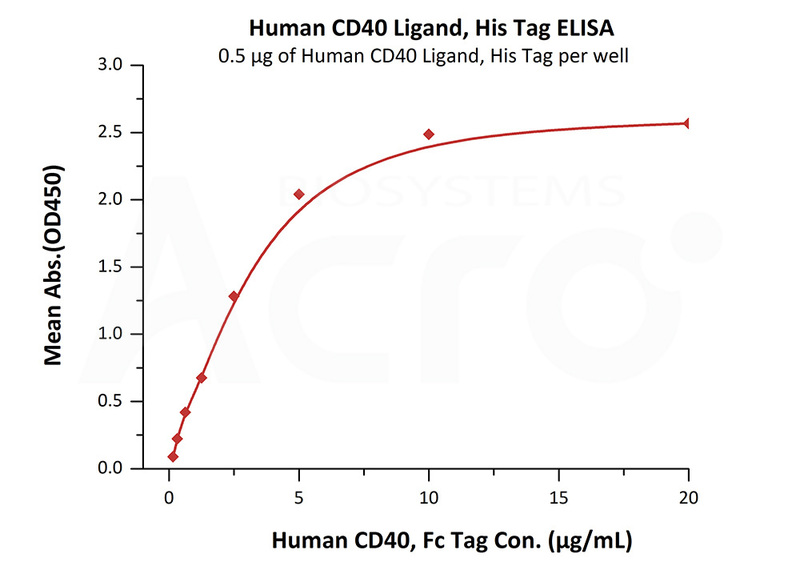 Flow Cytometry assay shows that Human CD40 Ligand, His Tag (Cat. No. CDL-H5248) can bind to 293T cell overexpressing human CD40. The concentration of Human CD40 Ligand used is 0.1 μg/ml (Routinely tested). 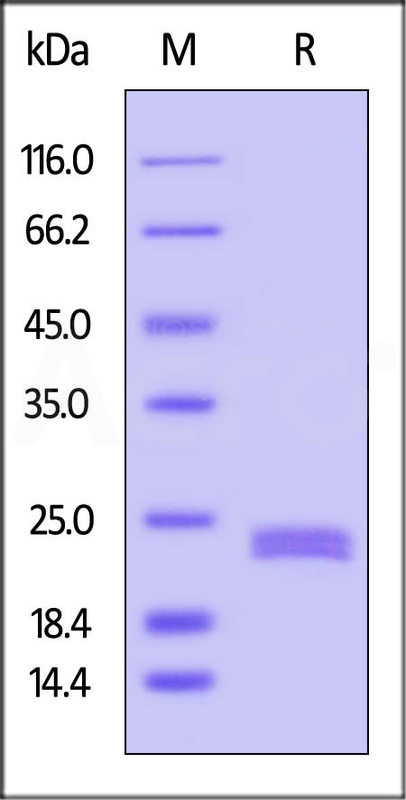 FACS analysis shows that the binding of Human CD40 Ligand, His Tag (Cat. No. CDL-H5248) to 293T cell overexpressing human CD40 was inhibited by increasing concentration of neutralizing Anti-human CD40 antibody. The concentration of Human CD40 Ligand used is 0.1 μg/ml. The IC50 is 1.181 μg/ml (Routinely tested). CD40 ligand is also known as CD40L, CD154, TNFSF5 and T-cell antigen Gp39, is a single-pass type I I membrane protein which belongs to the TNF superfamily of molecules. CD40 ligand is expressed predominantly on activated CD4+ T lymphocytes, and also found in other types of cells, including platelets, mast cells, macrophages, basophils, NK cells, B lymphocytes, as well as non-haematopoietic cells (smooth muscle cells, endothelial cells, and epithelial cells). Although all monomeric, dimeric and trimeric forms of soluble CD40 ligand can bind to CD40, the trimeric form of soluble CD40 ligand has the most potent biological activity through oligomerization of cell surface CD40, a common feature of TNF receptor family members. CD40 ligand binds to CD40 on antigen-presenting cells (APC), which leads to many effects depending on the target cell type. In general, CD40 ligand plays the role of a costimulatory molecule and induces activation in APC in association with T cell receptor stimulation by MHC molecules on the APC. In total CD40 ligand has three binding partners: CD40, α5β1 integrin and αIIbβ3. CD40 ligand regulates B cell function by engaging CD40 on the B cell surface. A defect in this gene results in an inability to undergo immunoglobulin class switch and is associated with hyper IgM syndrome. (1) Schönbeck U, Libby P, 2001, Cell. Mol. Life Sci. 58 (1): 4–43. (2) Furman M.I. et al., 2004, J. Am. Coll. Cardiol. 43: 2319-25. (3) Spriggs, M.K. et al., 1992, J. Exp. Med. 176:1543. (4) Fanslow, W.C. et al., 1994, Seminars in Immunology 6:267.